RUCKMAN Gach Nyuon has equalled a benchmark set by West Coast star Nic Naitanui, matching his absolute running vertical jumping record on day three of this year's NAB AFL Draft Combine. 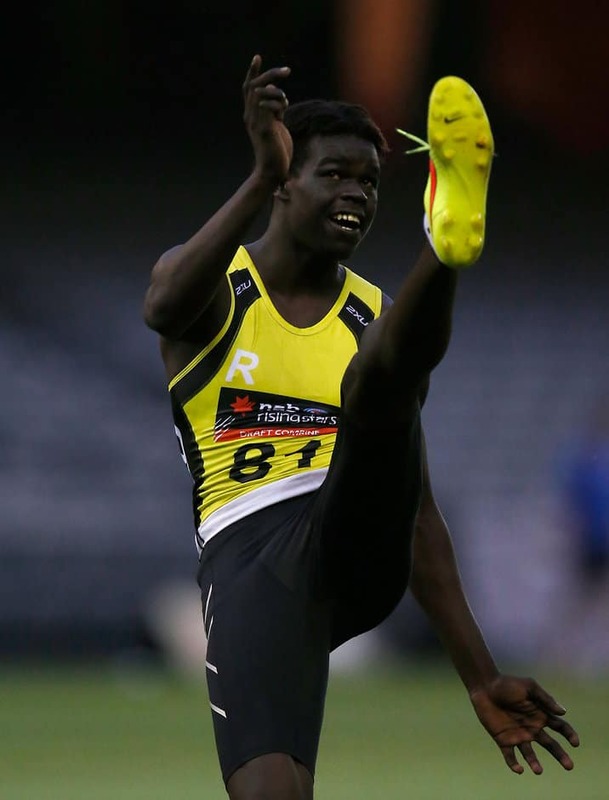 Nyuon, named ruck in this year's under-18 All Australian team, jumped 94cm in the relative running vertical jump, which was behind midfielder Lachlan Tiziani (97cm) as the best at the combine. But his leap matched Naitanui's absolute jumping record of 362cm, which was set in 2008 before the Eagles took the ruckman with pick two in that year's national draft. A player's absolute jump refers to the highest point he can reach when jumping off the ground (measuring the distance from the ground to the highest point the prospect can reach with his arm). A player's relative jump measures the height off the ground he has jumped (the distance between the player's feet and the ground). The Sudan-born Nyuon also proved his athleticism in the 20m sprint test, running 2.95 seconds. But it wasn't enough to displace Alex Morgan and Kurt Mutimer from the joint first position in the highly anticipated event, with the Victorian pair recording the best time for the combine at 2.88 seconds. They beat Eastern Ranges utility Liam Jeffs and Northern Territory speedster Daniel Rioli, who both ran 2.89 seconds for the sprint. Rioli, whose father is a cousin of Hawthorn premiership star Cyril Rioli, has enhanced his draft position in the past week after performing well for the Allies in the Grand Final morning curtain-raiser. The 18-year-old won the repeat sprint test on Saturday, running 24.15 seconds for the six back-to-back 30m sprints. Tasmanian midfielder Kieran Lovell claimed the honours in the agility test, running 7.90 seconds on the purpose-built floor at Etihad Stadium. An agility run under eight seconds puts him in elite company in combine history. The final event of Saturday was the beep test, when hard-working West Australian midfielder Josh Schoenfeld reached level 16.2. The 18-year-old's effort places him as the second best beep test in more than 20 years of combine testing behind Billy Hartung's record. Hartung ran level 16.6 in the beep test in 2013. The national combine concludes on Sunday with the three-kilometre time trial.